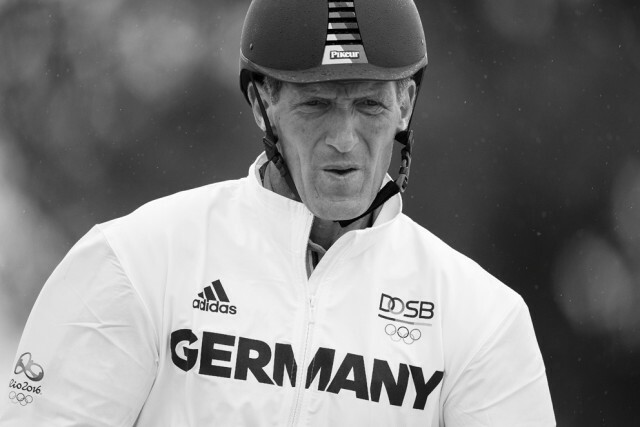 Press release FEI – “A legend in his own lifetime, a complete horseman and a man who is deeply involved in the development of the sport.” That was the description of Olympian Ludger Beerbaum given by FEI Jumping Director, John Roche, today after the announcement of the German rider’s retirement from his national team. Beerbaum, who turns 53 later this month, has long been the rock on which his country has depended at championships for almost 30 years. He took his first Olympic team gold medal in Seoul (KOR) riding a horse called The Freak in 1988, and two more at Atlanta (USA) in 1996 with the great mare Ratina Z and with Goldfever at Sydney (AUS) in 2000. The individual gold he clinched with Classic Touch at Barcelona (ESP) in 1992 was particularly memorable, achieved after a scary moment in the earlier stages of the event when he had to perform a mid-competition flying dismount from his horse. At his seventh Olympic Games in Rio de Janeiro (BRA) yesterday he added team bronze to his collection. Add in two gold, one silver and one bronze at world championships and six gold, three silver and two bronze from European championships, and the enormity of the achievement of this German flag-bearer and supreme athlete is evident. Beerbaum always wanted to quit at the top, and he will make his final appearance in his red Team Germany jacket at the Furusiyya FEI Nations Cup™ Jumping Final in Barcelona (ESP) next month. Emotions are likely to run high as he returns for the very last time to the scene of that glorious Olympic achievement at the very same venue, the Real Club de Polo, 24 years ago. “It was a tough decision” he said today. But he’s not leaving the sport completely. “I’m working on a number of projects and I will focus on my stable at home, and on training and selling young horses.” In fact his enormous influence will continue to be felt in many ways, because his equestrian centre, Riesenback International which opened just last year, will host national tournaments, clinics and international seminars. It seems he will, in fact, remain right at the heart of the sport. In addition to his work in Europe, as President of the Longines World Equestrian Academy Beerbaum will also be a huge support to the development of the showjumping market across Asia.